Air Costa has cancelled a significant number of flights listed in its approved Summer Schedule. As a startup airline with a different model, it faces issues on many fronts: one of which is an insufficient number of sufficiently qualified pilots to fly its four airplanes: two Embraer E170s and two Embraer E190s. The sectors affected are those that are operated by its smaller Embraer E170 aircraft-with a seating capacity of 67 each: Vijayawada <-> Hyderabad, Chennai <-> Madurai, Chennai <-> Vijayawada, Vijayawada <-> Vishakhapatnam, Chennai <-> Coimbatore, Coimbatore <-> Bangalore, Bangalore <-> Vijayawada, Bangalore <-> Hyderabad, and some of the Bangalore <-> Chennai and Hyderabad <-> Chennai flights. The Embraer E170s fly the shorter, thinner southern routes, while the E190s fly the longer, and thicker routes northbound out of the southern region, to Ahmedabad and Jaipur, connecting these cities to Hyderabad, Bangalore, and Chennai. The E190s also fly between Chennai <->Hyderabad, and Chennai <-> Bangalore, and connect Vishakhapatnam to Bangalore and Hyderabad. The E170s account for 22 flights a day, or 55% of the airline’s daily flights. The airline is tackling the situation by phone-calling each and every affected customer, explaining the situation and offering a full refund, contrasting a situation in late 2011 when the DGCA had pulled up IndiGo, SpiceJet, and the then-operational Kingfisher Airlines for having allegedly cancelled flights without informing passengers. Although the airline seems to maintain a low key when it comes to publicity, this act seems to highlight the airline’s customer focus: something no airline can afford to ignore, especially at the start-up phase of an airline. Customer focus and on time performance are key factors for many passengers when choosing between airlines that offer matching fares. Air Costa’s commercial flight operations commenced on 14th October 2013, exactly 6 months ago. The start-up phase, and the fact that the airline is the only operator of the Embraer E170/E190 airplanes in India, makes this a very challenging period for the airline. The airline presently has 22 pilots qualified to fly on the E170/E190 airplanes. Typically, an airline requires 10 pilots per aircraft, or 5 sets of crew per airplane. With 22 pilots, there are enough to fly just 2 aircraft, leaving the two other airplanes with no crew. The airline has chosen to fly the E190 airplanes, as its utilization on its network is much higher: 14.5hrs a day, which is upto nearly 2.5hours more than the E170s. Besides, the E190 with 112 seats in an all-economy cabin has a lower operational cost per seat, when compared to the E170. The airline had planned for a sufficient number of pilots to fly the routes in the summer schedule, starting 5th April 2014, but that plan didn’t materialize. 8 foreign commanders were supposed to have cleared the Foreign Aircrew Temporary Authorization (FATA) examination-an exam conducted by the Indian DGCA to ensure foreign pilots are up to speed with Indian regulations- at least 15 days before Air Costa was to have kicked off its full network under the Summer Schedule. However, the crew did not clear the examination, which is held fortnightly. Another 21 pilots will be joining the airline in a week, of which are the 8 FATA licence holders. The other 13 type rated pilots are Indians, of which 7 are commanders and 6 first officers. Recently, the airline hired 40 commercial pilots with no previous airline experience. Ground classes for these pilots are in progress at Vijayawada, before they’re sent for their Embraer E170/190 type rating. The type rating program may very likely be conducted at Jordan. Flights under the approved summer schedule are expected to commence shortly, once the 21 pilots are available. Air Costa is finding it difficult to have a sufficient number of qualified flight deck crew who may remain on standby, and also faces a shortage of examiners, who are instrumental in the release of Indian commanders and first officers. The airline is the only operator of the Embraer E170/190 family of airplanes, while every Indian other airline flies Boeing 737NGs and Airbus A320 family airplanes, eliminating the possibility of poaching experienced and ready-to-fly-on-type pilots. 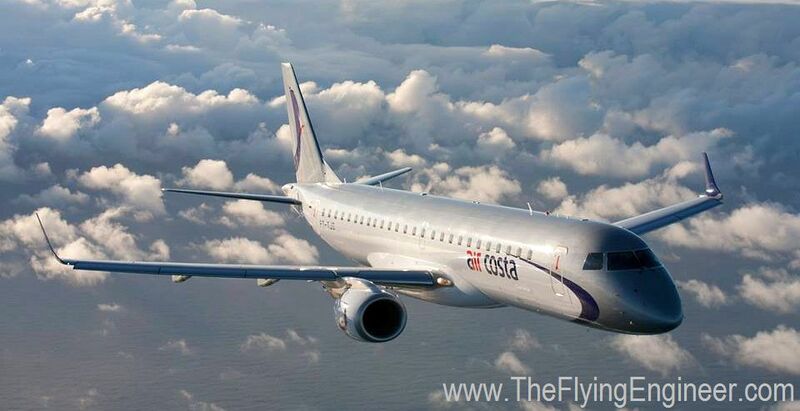 On March 30th, one of Air Costa’s E170s was grounded temporarily due to a windshield crack. The void left in the network was filled by one of the Embraer E190s: VT-LBR. The replacement windshield has arrived and been fitted on the aircraft, and is believed to have also been re-cleared for flight operations. The airline plans to add another 3 Embraer E190 aircraft to the fleet, one each in the months of August, October and December. As the fleet and flight crew members grown in number, the airline is expected to be less affected by such operational issues. Many of the shortlisted / selected Trainee First Officers have received their LOI but are unable to join as the TR fees are very high. If Air Costa offers a part payment alternative with the balance deduction from salary type offer then all selected TFO’s who have not yet joined will surely be ready to join. Requesting Air Costa Management to rethink on this issue. Any PNQ route expected or decided by airline? At start it was scheduled but cancelled. So any news by Air Costa to connect PNQ? !